An abandoned bunker discloses a secret. The V-Disc record, distributed 65 years ago to entertain the US troups world wide, is a remarkable relic from the Second World War. Peter Symons from England found some in his father's collection and loves to share the records and the story how they were found. His father found these two V-disc records in an abandoned bunker on Christmas Island in the late 1950s. Christmas Island, or Kinitimati, is an island in the Pacific Ocean, part of the so-called Line Islands, where the British were involved in nuclear tests. The first test on Christmas Island took place on the 15th of May, 1957. Peter's father was in the British Army, building runways and roads (Royal Engineers) from the end of 1958 thru into 1959. He took the two records and, although he served in a dozen other places world wide, brought them safely to England. Although we don't have firm proof, of course, US soldiers must have left these, then ten years old discs, in the bunker. Both records have the letters N C or N G written on it, but it unknown up to now what it means. Can someone help us to solve this? Let us know. The photos from Christmas Island on this site are from that period. UNTITLED VP 944- The Benny Goodman Quintet - recorded in New York City for V-Disc on the 25th of September, 1944 at the NBC "For The Record" show. Personel: see record label. The 30 cm ( = 12-inch) records ( LP-sized) were released during the 1940s to be distributed at the US front. It were non commercial releases, not for sale in regular record shops. In 1942 musicians, united in the A.M.F. (= American Federation of Musicians), asked the large record companies a fair price for royalties for the music that was to be heard on the air and in jukeboxes - the record companies refused and the A.F.M. proclaimed a record ban for its members - no more recording sessions as long as the record companies wouldn't pay fair royalties. This record ban lasted from July 1942 up to November 1944. In 1942 George Probert Vincent, a World War I veteran, became a technician at the Armed Forces Radio Service. This organization had to bring entertainment to the soldiers and recorded radiio programs. George Probert Vincent suggested to record music, specially for the soldiers. This was the birth of the so-called V-Discs. Thanks to the record ban a lot of musicians loved to participate and the A.M.F. and V-Disc laid down, that the records could be made on a non-commerical base as long as US soldiers were in war and that the original masters and records should be destoyed after that period. The records, called V-Disc ( from Victory Disc) and the records were not sold in record shops in the States. PEEWEE (sic) SPEAKS - VP 974 Muggsy Spanier and his V-DISC All Stars. Recorded in New York City the 17th of October, 1944. Introduction speech by Muggsie spanier. Personel: see label. The records contained the popular vocalists and bands of the period, like Bing Crosby, Benny Goodman, Frank Sinatra and a hundred others. As the records were made of a kind of vinyl, they were unbreakable, so the packages with records could reach the soldiers all over the world even under severe conditions. As the records were sized 30 cm ( or 12-inches) the average playing time was ca 5-minutes each side. Normally one side contained two regular tracks and on te reverse a more extensive ones. ( like V-Disc 342). I LIKE TO RIFF / SMILES VP 903 Charlie Barnet and his Orchestra. 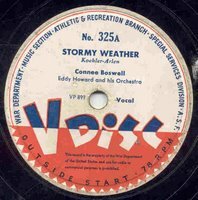 Recorded on the NBC Broadcast For The Record New York City on the 11th of September, 1944 and released as V-Disc ( Army) 342 and V-Disc (Navy) 122. Personel: Peanuts Holland tp vo - John Martel, Jack Mootz, Lyman vunk tp - Porky Cohen, Ed Fromm, Dave Hallett, Tommy Pederson tb - Charlie Barnet, Rae De Geer, Gene Kinsey, Kurt Bloom, eddie Pripps, reeds, Danny Banks bariton sax - Dodo Marmerosa p - Turk Van Lake g - John Chance b - Harold Hahn dm. Peanut Hucko vocal and trumpetr on I Like To Riff. The soldiers could send their requests and V-Disc organized recording sessions. The music on the records was specially recorded for V-Disc, but also old masters ( sometimes alternetive takes from previous commercial releases) were used. In 1944 a radio program was launced, entitled For The Records, where musicians played live for V-Discs recordings. US Navy GI's enjoy the V-Discs. A lot of V-Discs had an anouncement or calls from the bandleader. The untitled tune by Benny Goodman, later entitled as Slipped disc, was recorded in the For The Record show of the 25th of September, 1944 - the Charlie Barnet recording of I Like To Riff and Smiles was recorded in a For The Record show on the 11th of september, 1944. Both tunes were also released in a series of V-Discs specially made for the Navy ( V-Disc (Navy) 122)). FISH MARKET VP 917 - Gene Krupa and his New Orchestra. Recorded in New York City on the 15th of August 1944. Personel: Tommy Allison, Marty Olson, Pinky Savitt, Al Stearns tp - Leon Cox, Bill Culley, Tommy Pederson tb - Ray De Geer, Harry Klee, Don Brassfield, Charlie Ventura reeds - Stuart Olson bariton sax - Tedy Napolaon p - George Cuomo g - Sid Weiss b - Gene Krupa and John Dales dm. When in November 1944 the record companies and the American Federation of Musicians agreed over better rates for their royalties, the production of V-Discs continued, until the end of the 1940s when the series was stopped. Thanks Peter for sharing these great V-Disc labels and for let us show the pictures of your father's archive. Thanks to your father who saved these relics from this long-gone period. V-Discs were specially made recordings by the Music Section, Entertainment and Recreation Branch, a special Services Division of the US War Department and were sent to the soldiers at the front all over the world. As a lot of these 65 years old relics were destroyed after the war, these records are now collectors items. Thanks to Peter Symons' father, who served as a British engineer on Christmas Island in the Pacific Ocean during the 1950s two of these special records were found in an abandoned bunker. If you love to read more about this kind of stuff, ask for the Keep Swinging newsletter and we'll keep in touch. Vincent's middle name was Robert, not Probert, and he always went by the name of G. Robert Vincent, or Bob Vincent. Also, he always claimed, and seemingly not in jest, that the V stood for Vincent, not Victory!!! NG? Commonly used in America as an abbreviation for "No Good," and I wonder if someone either didn't like the music on these discs, or if perhaps they'd just been played so much that the grooves were worn away.